Hi! I stopped by my store this week to check out some of the new July 2016 catalog arrivals. While I am feeling fairly set with summer clothing, I did want to check out a few items that are on my wishlist. 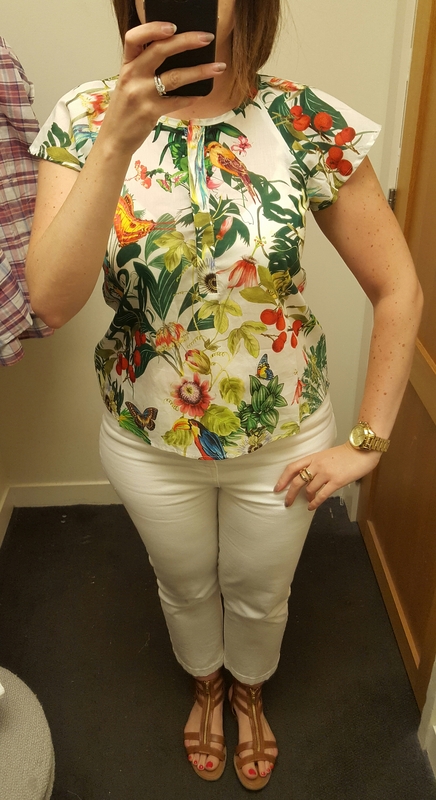 At this point, I’m waiting for items to go on sale before I purchase any more summer clothing…but that doesn’t mean I can’t have fun trying some things on! First up, the Mixed-Stripe Pencil Skirt and the Cotton Jackie Cardigan in Embroidered Palm. I had the skirt on my to-try list and the Jackie cardigan is paired with the skirt in the store, so I tried that on as well. I’m wearing a size 12 in the skirt and a Large in the cardigan, which are my usual sizes. The cardigan is a tad loose but I think you’d want to wear this one button so i would opt for the larger size. I’m personally not one for tropical style prints (maybe it’s living in the Northeast) but I can see why there’s a lot of love for this cardigan and as an outfit liked it (not with these sandals – I had them on to try for size). I should have grabbed a full shot of the skirt without the cardigan covering it but I personally was a fan – there isn’t a lot of stretch in it but I was able to wear my regular size without having to size up which I do need to do sometimes in the non-stretch skirts. I like the horizontal/vertical stripe mix. Do I need another striped skirt? Probably not, but it’s a good way to mix it up and I’ll watch for this one to hit sale. The skirt and cardigan are both black. Next up, the Short-Sleeve Chambray Shirtdress. After seeing this on a few ladies on Instagram, I really wanted to try this out. This dress runs S/M/L and comes in petite and tall. In the oxford cotton version of this dress, I went with a Tall Large but that wasn’t necessary on this dress and the Large was comfortably long enough for me. It is on the looser side, but I don’t think I could have sized down with my hips. I’m 5’8″ and this is right above my knees. The wrinkles of course take a little something away…when is my Crew going to learn to steam everything?? Regardless, I like the lightweight but not too lightweight fabric in this. Yes, the wrinkles are a little concerning but this is definitely staying on my wishlist. It’s such an easy summer weekend dress. I tried the Corsica Tumbled Leather Espadrille Wedges on for size which I loved paired with this dress – I’m a fairly solid 9.5 in J.Crew shoes and they only come in whole sizes and while the website suggested sizing up, sizing down a half size to a 9 was the right call. I have my eye on the light gold version of these shoes but my store was sold out in this color. The next item I tried on the request of a few friends – Ruffle-sleeve top in Ratti® Into-the-Wild print. 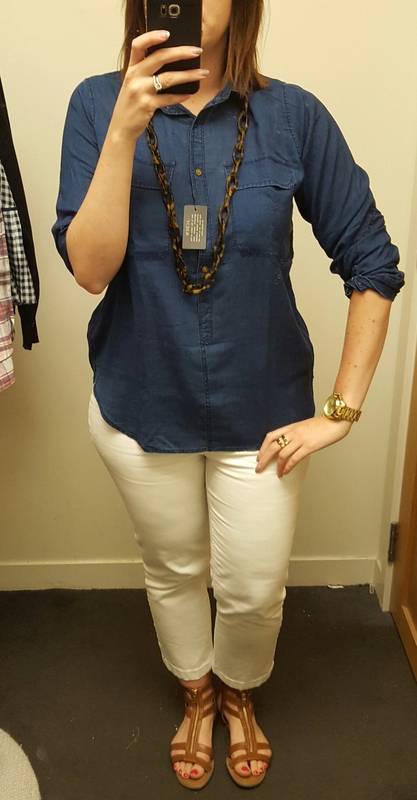 The largest size they had in my store was a 10 so I tried that (I’m usually a 12 in blouses). The 12 would have been a better fit – while this wasn’t tight through the arms or chest, it felt a little skimpy on me and I would have appreciated the extra room in the 12. The 10 Tall might work as well. The sleeves are very fluttery and the material is a lightweight cotton. It isn’t terribly sheer but it is lightweight you can see my (white) bra in the photo – a skin tone colored bra may fix that issue but note that the cotton isn’t opaque. Personally, as I said, I am not a tropical/critter type print person. However – a lot of people will like this. I wish we had seen a pencil skirt in this print. It’s a pass for me but I’d say it’s true to size and a great summer print for those ladies who like the tropical prints. Next up, the Ruffle-Hem Silk top in Gingham. I tried this in a 12 which was the right size, although I did feel like it was a bit short. It’s a very lightweight silk. Personally, I don’t think the website shot of the model wearing this top is terribly flattering so I didn’t have high hopes for this one but I liked it better on than on the hanger. I think the fact that I have curves helps this top a bit, but I am content with my gingham Martie pants and the gingham cashmere cardigan I snagged in the online pricing mishap. Next up, the Indigo Gauze Popover Shirt. I tried this top in a size 12 and it was loose without being sloppy. I often find popovers to not be long enough but this seemed to be a little longer than most that I’ve tried. It’s very lightweight but not sheer at all and in person it looks like a lightweight denim shirt so the “gauze” naming surprises me. I should have hid the silly tag in the front for the photos. Last up, the Short-Sleeve Popover in Vintage Plaid. 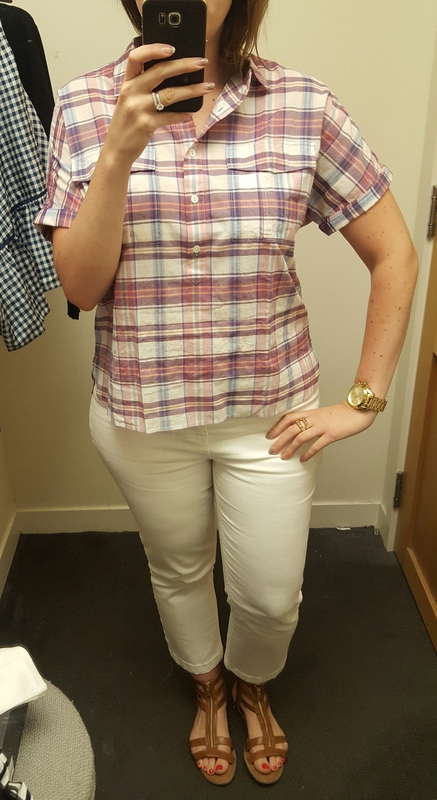 I’m not usually a plaid in the summer person but I liked the colors in this one. I tried a 12 and as you can see it is HUGE. I didn’t love it enough to try a smaller size but definitely size down in this one. I liked that this was lightweight without being see through and if it were not cut so boxy I might have reconsidered it. So…there you have it, some of the new July items. Do you have any favorites? Would love to hear what you think and thanks for visiting!